Use price monitoring software like PriceManager to ensure customers have a one-stop-shopping experience. It’s become known as the biggest shopping day of the year, but many customers stay home. Why? For some of them, it’s because at some point in the past they had a bad Black Friday experience that taught them to stay away. Each year, retailers welcome large crowds into their stores on the biggest shopping day of the year. They have the chance to either make it a great customer experience or leave those customers with a bad impression. Having friendly, helpful employees in place is only the beginning. Anyone who has ever been a part of Black Friday knows that crowd control can be a major issue. A store that usually accommodates dozens of people at a time can suddenly find itself with hundreds, if not thousands, of customers. They may camp out on the sidewalk outside the door and rush in when doors open, especially if a store is offering extremely competitive deals. Businesses should make sure they have the capacity to handle the customer volumes before advertising extraordinary deals, including setting up ropes to direct shoppers as they navigate the store and line up at checkout stations. Tablets have become a valuable resource for retailers, who can now use them to equip sales floor staff with the tools they need to help customers. If an item is out of stock, an employee can locate it in another store or help the customer buy it online, with it being shipped directly to that customer’s home. When lines get long, sales floor workers can be set up to check customers out directly from the sales floor, allowing them to quickly be on their way once they’ve made their buying decisions. On Black Friday, competitive prices are essential. Customers feel inconvenienced when they arrive at a store, only to find its prices are higher than what competitors are charging for the same items. Shoppers now arrive in stores with smartphones in hand, ready to look up prices while they’re standing in front of an item. Stores can prepare to be as customer-friendly as possible by setting up a price-matching tool that will allow them to not only have the lowest prices but be alerted when a competitor price drops. 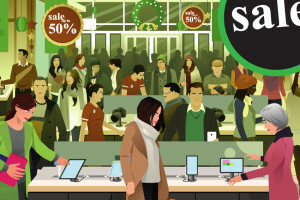 Once Black Friday is underway, retailers have little time to make important changes. To be most effective, retailers should plan well in advance of the big day, setting up crowd control, promoting competitive pricing, and using price monitoring software like PriceManager to ensure customers have a one-stop-shopping experience.